Whether you’re going away with friends or family, carving up the slopes is a wonderful way to bond. While there’s nothing wrong with a nice holiday to a tropical destination, if you’re skiing or snowboarding together, you’re being more adventurous and creating some pretty fun memories together. Chances are people in your travel party will have different levels of ability, so you can work together to teach the less experienced skiiers or snowboarders some tips to help them feel more confident on the snow. If your children don’t know how to ski, don’t worry. Look for a mountain that has a ski school, it will help them learn the basic skills they need while allowing mom and dad some free time to enjoy the slopes themselves. If you’re traveling with really young children that are perhaps too young to get on the snow, you could rent out a sled for them. Many mountains also have daycare options for really young children, so you can rest assured your children will be happy while you’re getting in a few good runs. There’s nothing quite like a picture of you set against the white of a snowy winter. In my experience, because mountains are so high, you can also see some pretty incredible views from the top of a mountain. I think snow gear also looks pretty cool, so be sure to snap a ton of photos of you and your friends while up on the mountain. Better yet, if you have a GoPro or know someone you can borrow one off, don’t forget to take it along. You can get some pretty incredible footage of you carving up lines in the snow with a GoPro. Don’t be too shy to ask someone to take a group shot of you, after all, it’s important to get everyone in the photo to remember who came with you on this special trip. Many mountains also offer the option to work with a professional photographer who is a skilled skiier or boarder in order to get some professional photos of you and your friends. Chances are this is a great option if you have a high skill level, as the photographer will be able to properly capture you. If your budget is low, or your friends are of similar ability to you, ask them to follow you on a run to capture some cool photos. Be sure to wear some interesting ski gear, so that the contrast between the icy white snow and your outfit is striking. If you have ever spent a day on the mountain skiing or boarding, then you can attest to the fact it’s a pretty solid work out. I used to ski in the morning and work in the afternoons and I found it near impossible to walk around after a few hours of solid skiing action because my calves were so stiff! Usually when I go away on holiday, I tend to gain a few pounds which isn’t ideal. However, when I’ve been away on skiing trips, I tend to lose a little weight from being so active. I’ve always said the best way to keep healthy is to find an exercise or sport that you enjoy, and then working out won’t feel like work. That’s exactly how I feel about skiing, it’s just so fun I could literally do it for hours and hours without feeling like I’ve been exercising. But both skiing and snowboarding require a lot of muscle activity in order to stay upright, handle the turns well and maintain your speed. It’s a great holiday option for friends or family members that want to keep fit while they’re traveling and not gain too much weight! You may think of snowboarding or skiing as kind of a solitude sport, after all when you’re doing a run, you’re usually off by yourself working it at your own pace. But skiing actually affords numerous opportunities for you to meet new people and to make new friends. Ski lifts tend to fit between three to six people and to minimize wait time, the ski lifts will be filled with as many people each time to get the line moving. This means you’ll likely be sat next to new people for a good 10-15 minutes, providing ample time for some great random conversations. I’ve met some really interesting people while on the lifts and it makes the wait time go so much faster! Likewise, because of the cold, most people pile into the restaurants or cafes to eat during lunchtime. It’s a great way to meet new people as you know at least you both have one thing in common: a love for skiing. That makes it easy to start off a conversation as you already have one thing in common. You can ask them where they’ve skied before, whether they’ve been to this mountain before and how long they’ve been skiing. They’re all easy conversation starters that can make it extremely easy to meet new friends. As I mentioned, I don’t love the cold. Winter can make me feel a little down as I miss the long days of summer, the daylight lasting well into the evening. When you’re just living in the cold weather, with the days getting shorter and shorter, it can be hard to see anything to like about winter. It’s often wet, cold, and there’s just generally less to do. 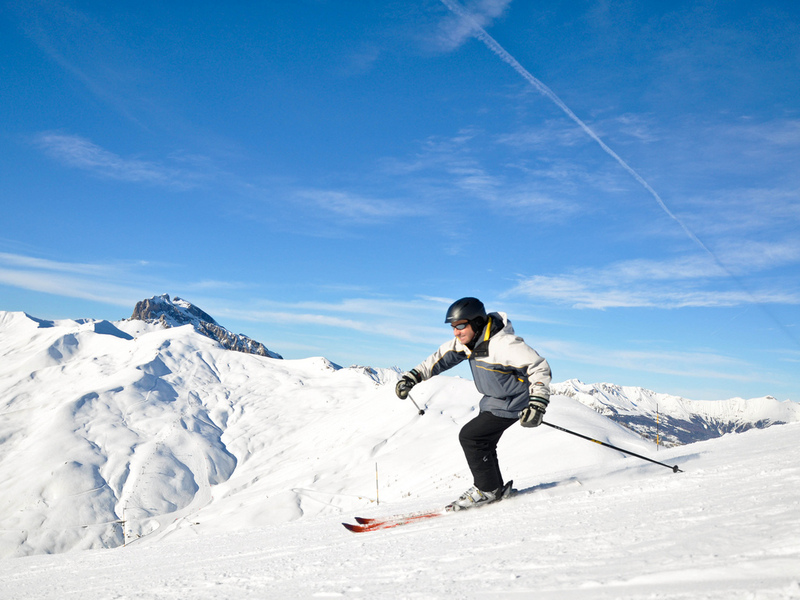 Going on a ski holiday is a great way to make this cold weather fun because you can only ski when it’s cold! Doing something I like, such as skiing, when it’s freezing outside makes me grateful for the cold weather and the opportunity to participate in a sport that’s only available for a short period of the year. While my favourite part of skiing is obviously getting a good run in, I love the whole ski trip vibe. From getting up way too early to drive to the mountain, putting on the chains if necessary, going up a beautiful but often scarily steep road, decking myself out in puffy warm clothes and walking with boots through the powdery snow, it’s all part of the adventure! I can tolerate a rainy, cold day at home with a bit more spring in my step if I have at least enjoyed one of the benefits of winter! Ski holidays are a fun family adventure or a great experience with your friends. If you’re hoping to go away on a holiday this winter, why not consider a ski holiday?